Heed the Grail Knight: Can the Air Force Choose Wisely? Previously, I outlined what I perceived to be the erosion of mission-based culture in the Air Force. The overwhelming response tells me I was not wrong — it was one of the most-read War on The Rocks articles ever. While reaffirmed in a recent article that applied machine learning analytics to surveys, Gen. David Goldfein’s squadron revitalization team offers the most sobering assessment yet. While potentially startling to outsiders, it was no surprise to insiders that the team discovered that “many units struggled with clearly defining and communicating their purpose.” Air Force leaders have made some small strides in the right direction, but more can be done. The 2018 National Defense Strategy provides a lens to refocus the force, however there is a problem. With more mission than Air Force there are only three possibilities: increase the force, reduce the mission, or find a better way to successfully execute assigned missions. Department of Defense leadership has testified that upwards of 5 percent annual budget growth — above inflation — is required for the next several years to implement the strategy. However, flattening defense spending appears to be gaining undeniable bipartisan support. Fortunately, there is a significant opportunity on the horizon. Some factions in Congress also appear serious about assessing and debating the roles and missions of the U.S. armed forces. 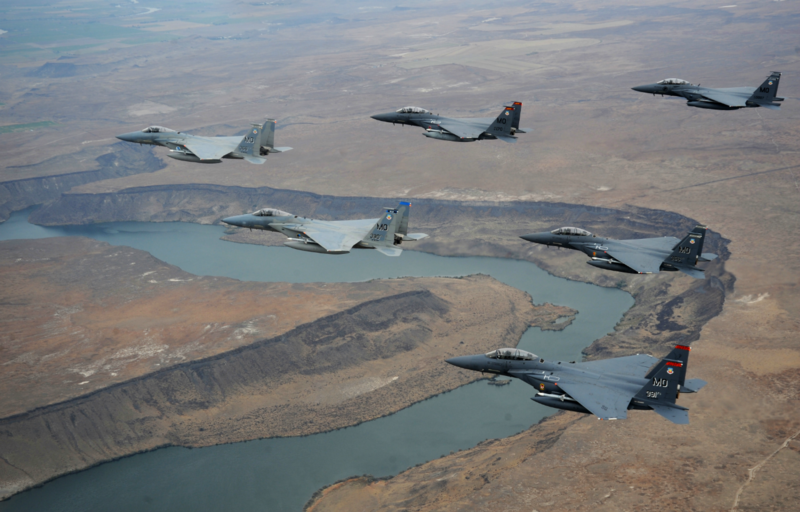 Given the disparity between strategy and resources, so should the Air Force. Rather than start with proposals on what to cut or what to change, I hope to pave the way for a broader conversation among airmen about the importance of such choices. Heed the caution of the Grail Knight from Indiana Jones: “You must choose, but choose wisely, for while the true grail will bring you life, the false grail will take it from you.” The Air Force has been down this road before, and it fundamentally influenced the service, both physically and culturally — it chose poorly. As the Cold War began to thaw, the Department of Defense anticipated massive cuts to defense spending. To address this, in 1990 the Base Force strategy was released. This strategy abandoned the concept of forward defense, which underpinned both the Air Force and Army’s large force structure. In response, the Air Force released Global Reach-Global Power, an advocacy paper outlining five purposes of the service. Following the collapse of the Soviet Union, in 1993 the Bottom-Up Review proposed further force reductions, prompting Congress to establish a commission on the roles and missions of the services. In 1994, the commission published its report, listing three core competencies for the Air Force: air superiority, global strike/deep attack, and air mobility. Unsurprisingly, this report essentially reaffirmed the service’s priority functions from the 1948 Key West Agreement, the origin of the Air Force’s functions as a separate military branch. The following year, the Air Force released five core competencies of its own, only to replace them with six in 1996. By then, space superiority, information superiority, and agile combat support all had a seat at the table. The portions of the Air Force being cut were also being increasingly relied upon for limited scope operations: Operations Northern Watch/Southern Watch and Desert Fox in Iraq, Deny Flight, and Deliberate Force in Bosnia, and Allied Force in Kosovo. After September 11, 2001, the military once again had a unifying threat. Unfortunately, it wasn’t aligned with the primary purpose of the Air Force — let alone the military. The Department of Defense became narrowly focused on Afghanistan and would soon turn its gaze towards Iraq. As the Air Force (and Navy) ceded budget to the growing Army and Marine Corps, it renamed its core competencies to six distinctive capabilities and paired them with a new list of 17 operational functions. At the same time, it announced plans to cut 40,000 airmen and retire 33 bombers. Airmen that remained began to fill deployed Army positions. The Air Force was changing. By 2007, the Chief of Staff of the Air Force acknowledged the shift away from the profession of arms and towards a “conglomeration of diverse specialties, skill sets, or jobs.” The Air Force was heavily tasked, but increasingly disconnected from its primary purpose. Attempts to culturally mend the service resulted in more words — the “Airmen’s Creed” and a new mission statement — yet once again actions spoke louder. The F-22 program was curtailed and by 2008 25 percent of all airmen deployed to the Middle East were filling Army positions. The pattern continued. When the Department of Defense released the nine functions of the Air Force in 2010, the Air Force responded by adding three more to arrive at 12 core functions — special operations, building partnerships, and cyberspace superiority. A sign of the times, these additions coincided with a new strategy in the Middle East and the stand-up of U.S. Cyber Command. Soon after, 246 fighter jets were cut to pay for higher priorities — even though the Air Force was increasing fighter deployment lengths due to mission demands. A byproduct of failed compromises in Congress, in 2013 the Department of Defense faced sweeping across-the-board budget cuts from sequestration. Beyond the initial grounding of a significant portion of its combat fighter and bomber squadrons, 20,000 more airmen were cut. However, the most controversial move was the attempt to retire the A-10. Platform and mission aside, the process-of-elimination rationale spoke volumes about the Air Force’s priorities and what it valued as an institution. As in times past, the Air Force seemed to blunt the impact of their actions with more words. In 2013 the Air Force rolled out its latest rebranding with five core missions: air and space superiority; intelligence, surveillance, and reconnaissance; rapid global mobility; global strike; and command and control. A long and winding road of progress, or was it? A pilot once testified to Congress that military aviation had four purposes: reconnaissance, fire control for artillery, aggressive action (i.e. fighting), and transportation. While that doesn’t sound fundamentally different than today, realize he testified in 1913. What should be clearly understood has become abstract. Today’s Air Force is a sprawling conglomerate of organizations with a wildly diverse spectrum of missions that a majority of airmen don’t even understand, which is likely why they are doing tasks but cannot explain why they are doing them. Note that every single Air Force general officer in uniform today is a byproduct of this era. Some have been indoctrinated, others have scars. Airmen do not need more taglines, buzzwords, catchphrases, or other motivational fodder — they need purpose. Despite all the rhetoric, the reason the United States has an Air Force is actually quite simple. In fact, its role has remained unchanged since it was written into law in 1947: “be organized, trained, and equipped primarily for prompt and sustained offensive and defensive air operations.” Everything else is support, a byproduct, or a distraction. That is built on a higher purpose. Being a military branch, the Air Force should possess military capability that is uniquely suited to wield out of military necessity, in order to achieve a military objective. The purpose of a military is to exert sufficient force to break an adversary’s body, mind, or spirit in order to bring about the end of war. Combined with the other instruments of power, the military is a nation’s sword and shield that advances and defends national values, interests, and objectives — whether through action or the threat of action. With purpose in mind, priorities become clear when resources are stripped away. The Air Force can choose wisely. It has done it before, and it can do it again. Much like Afghanistan and Iraq, in Vietnam the military fought for so long that it forgot the challenges it still faced elsewhere in the world. Fueled by the frustrations, shortcomings, and scars experienced in the war, there were no sacred cows in the slaughter house — tactics, training, doctrine, and weapons programs were all fair game. The dismal performance of weapons led the Air Force to establish an air-to-air weapon systems evaluation program in 1972 — now known as Combat Archer. In 1974 the Air Force instituted Designed Operational Capability statements. These unit-specific statements tailored mission sets to focus training in order to maintain combat proficiency in a maximum of two primary missions (and one secondary mission). These were paired with a new monthly flying readiness model to better plan and allocate fiscal resources. Building on this framework, the Red Baron reports led to the establishment of aggressor squadrons and exercise Red Flag in 1975. The same year, Alaskan Command started its version of Red Flag called Jack Frost/Brim Frost, which is better known today as Northern Edge. Following the Air Force’s example, the Army built an equivalent to Red Flag called Red Banner in 1977. This became the Army’s National Training Center at Fort Irwin. To provide close air support to these Army exercises, the Air Force established Air Warrior — better known today as Green Flag. By 1977, the fighter community reached a turning point. The notoriously stubborn Fighter Weapons School scrapped their rite of passage that passed for teaching and replaced it with what was called “the building block approach.” Each flight was designed for a purpose, and built on the skills and purpose of the preceding flight. Thus, the final objective drove every aspect of the training program. The quality of graduates increased, and the instructors got even better. The Air Force also developed the A-10, B-1, F-16, F-117, and KC-10 — all within an extremely narrow ten-year window. While an impressive shift on its own, note all of this was accomplished during a period of flat defense spending. When AirLand battle was released in 1982, the Air Force had a strong foundation on which to build. The results in Desert Storm nine years later speak for themselves. The adversary has watched, learned, made hard choices, and adapted to meet the enormous advantages the U.S. Air Force has held since then. It is now time for the Air Force to adapt with a countermove of its own, with the force structure it has built. Today, the Air Force has been tapped to re-enter the ring with major competitors. It is currently rethinking the structure of the wing, developing a force presentation model, getting serious about distributed operations away from large vulnerable airbases, and being operationally unpredictable. While notable, all of this is meaningless without experienced aviators, skilled aircraft maintainers, adequate unit support, sufficient parts to keep aircraft flying, and ample munitions to wield the hammer of airpower if and when called upon. Prioritizing the Air Force’s roles and missions is not just a fiscal necessity — it’s a cultural imperative. The Air Force needs to focus on reducing missions that are on the fringe of its purpose, reinvigorate its inherently innovative base, while being receptive to imaginative new ways to return to its roots of expeditionary airman in order to meet the missions that justify its existence as a military branch. Change is hard, but required. Let purpose be the guide; task, mission, and culture will follow. Strategy is about choices, and the time before the Grail Knight has come. This time, let’s believe the Air Force will choose wisely, and the true grail will bring its culture back to life. Maj. Mike Benitez is a U.S. Air Force F-15E Strike Eagle Weapons Systems Officer with over two decades of service in the Air Force and Marine Corps. He is a graduate of the U.S. Air Force Weapons School, a former Air Force legislative fellow in Congress, and a Contributing Editor at War on the Rocks. The views expressed are those of the author and do not reflect the official policy or position of the Department of Defense or the U.S. government.